In the last ten months, residents in Edo State have experienced governance like they’ve never had before. This is as a result of the pace-setting, uncommon approach to service delivery adopted by the Governor Godwin Obaseki-led administration. Come November 12, 2017, his administration will be a year old in office and, truth be told, the state has had to grapple with a myriad of challenges, amid dwindling financial resources across the nation. But, with the progress seen so far, he has shown to be undaunted in the resolve to build a sustainable foundation for the revival of the state’s local economy and attract foreign investment. In his inaugural speech on November 12, 2016, Governor Obaseki promised to carve a new path for development, towards improving the socio-economic wellbeing of the people, while building on the programmes of his successor, in tandem with the overall objective of government. He promised to expand infrastructure in the widest sense and build a robust human, intellectual and metaphysical infrastructure for the significant progress of the state. He stressed that he remained committed to his promise to create 200,000 jobs in four years. He equally assured that his administration would improve health care delivery, provide support for small scale industries, electricity generation, enhance environment for industries to thrive, urban renewal, education and curriculum development, especially on technical and vocational education and Information Communication Technology (ICT). Hence the policy thrust of Governor Obaseki’s administration so far has been towards delivering on these promises, and he has been working quietly, but doggedly, to achieve them. Governor Obaseki has a passion for environmental sustainability. This informed his constituting a committee on Project Clean-Up Edo in December 2016. It was followed by a two-day workshop of all stakeholders in the sector, in March, 2017, which held under the distinguished chairmanship of former Cross River State Governor, Donald Duke. To further actualise the vision of a clean and green Edo, the state government embarked on training of the Edo State Waste Management Board (ESWMB) workforce and waste managers, towards ensuring a clean, safe and work-friendly environment. 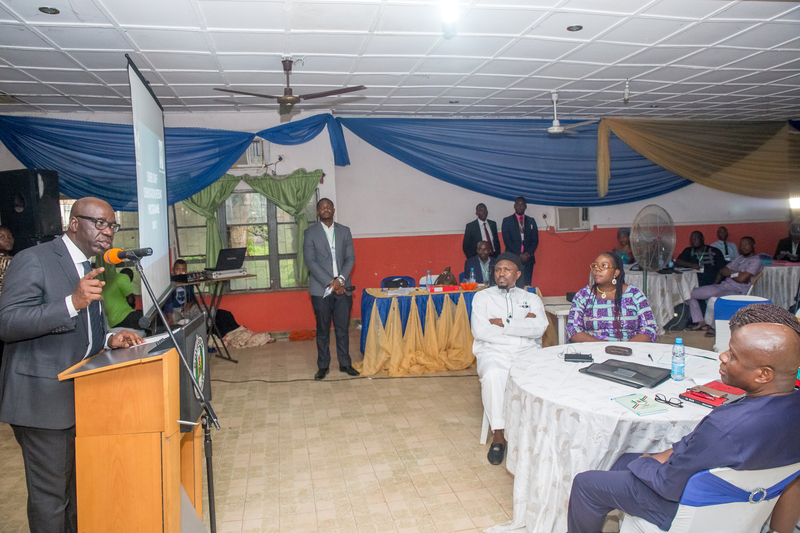 The blueprint for the task was unveiled in details to the team, during a one-day retreat on “The New Waste Management Reform and implementation Strategy”, put together by Committee on Project Clean Up Edo, in Government House, Benin City. Understanding that the environment has a direct link with health, investment, and tourism, which in turn have multiplier effects on the populace, Governor Obaseki pledged men, materials and resources towards the scheme to achieve the desired result — a departure from the past. As a result, the three major city centres namely Kings Square, Third Junction and New Benin Market area, have been rid of chaos and debris, the aftermath effect of what used to be a hotbed of activities of traders and commercial motorists. Past administrations have tried to clean up the state in order to quickly curb the menace, to no avail. The new administration says it has the will; and Edo people can attest to the fact that government is delivering on environmental sustainability. The state government has also made move to enhance the capacity of Civil Servants in the state, by partnering with the Chartered Institute of bankers in Nigeria (CIBN). Plans have been finalised to launch the state’s Civil Service Training Institute and a training programme for Directors of Finance and Administration in the Civil Service that will expose them to current industry trends. “We are in government to create a clean and secure environment, streamline our revenue collection process and rid our cities of traffic congestion so that people can move around easily. For us to sustain these, we need to collaborate with the Chartered Institute of bankers in Nigeria (CIBN)” said the governor, just as he added that his administration was working towards making the state a regional banking centre. The educational sector is being revamped and remodeled at all levels to meet up with global standards. Also, in a bid to restore sanity and morals to school administration, the state government ordered the removal of illegal structures from school premises, and banned the collection of illegal fees from students for the purchase of uniforms and other items by principals of public schools. The state government has also taken steps towards improving Vocational and Technical Education, which is another proven route to sustainable economic empowerment. Reconstruction is on-going at the old Benin Technical College. According to Governor Obaseki, “Success is not defined by the possession of a university certificate, rather success is what the individual can do with their hands”. He is of the opinion that the future would be defined by knowledge and technical expertise, and as such Edo state shouldn’t be left behind. The reconstruction project would provide 1,300 direct jobs in the next 18 months, and at least 800 of them would be reserved for Edo residents and indigenes. Part of the plan is to refurbish the existing buildings, equip several workshops and train teachers for delivery of a well-rounded technical education. Upon completion of the project, the state will have an institution that will produce between two to five thousand well-trained technicians yearly. The administration believes in the acquisition of relevant skills because it is the first fundamental step to job creation and will help reduce the huge deficit in technical manpower. Furthermore, the administration has made some strides towards empowering women, caring for the less–privileged in the society, as well as providing critical infrastructure and enthroning law and order in the state. As part of its commitment to sanitize the road transport sector, the state government recently proscribed the state’s chapter of the Road Transport Employers Association of Nigeria (RTEAN), to ensure protection of lives and property, and prevent the possible breakdown of law and order. Governor Obaseki equally flagged off the operation of the State Transport Management Agency (EDSTMA). Over 300 persons have been employed in EDSTMA. There are massive road construction and rehabilitation in different parts of the state. From Edo South, to Edo Central and North, the people have witnessed increased efforts at restoring bad roads and paving of new ones to ease movement. In Edo South, Ehaekpen street, TV Road, Lucky Way; in Edo Central Idumebo-Ihumudumu Royal Market Road, among others, are currently under reconstruction. In the healthcare sector, apart from making efforts to ensure that adequate services are rendered to the people, Governor Obaseki set machineries in motion to shore up immunisation coverage in the state. He awarded N10million to the best performing local government areas for immunisation coverage, even as sensitization efforts have been scaled up since the announcement. According to the World Health Organisation (WHO), Edo state was adjudged the best performing state in routine immunisation coverage in Nigeria, with no variation between its administrative data and the outcome of the national Immunization Coverage Survey conducted in 2016. Hopefully, this would be one among many other feats to be recorded in the health sector. The Agricultural sector is not left out. In fact that is where the state government hopes to create thousands of jobs by attracting foreign investors. The passage of a law banning Community Development Association (CDA) across the state is another milestone. A committee on Private Property Protection was also constituted by Governor Godwin Obaseki to enforce the CDA law by ensuring that a stop is effectively put to the activities of proscribed CDAs. The level of compliance with the CDA law has been quite impressive, as residents now acquire land and build houses without fear of being harassed or extorted. All these and many more Governor Obaseki is quietly and strategically putting in place to achieve his vision for Edo state. There is no doubt that the task ahead is daunting, to say the least, but this administration seems bent on wading against the tide to get the job done. It is hoped that much progress would have been made on all fronts before the tenure of Godwin Obaseki is over.